Eating fish can be part of a healthy diet. A balancing concern, however, is the amount of mercury consumers might ingest along with the fish. It's an unfortunate fact that mercury is in the environment and, when it gets in the water, it also gets into fish. Researchers presenting their findings at the American Academy of Neurology meeting in Boston in April are offering a preview. They say they found that increased consumption of high levels of mercury from seafood is associated with a greater risk of amyotrophic lateral sclerosis (ALS), also known as Lou Gehrig’s disease. ALS is a progressive neurological disease that is ultimately fatal. The researchers make a distinction between species, however. They say just eating a lot of seafood is not associated with a greater risk of ALS. To reach their conclusions, the researchers studied more than 500 people. More than half had been diagnosed with ALS. The participants were quizzed on how much fish was in their diet, whether it came from the supermarket or was wild-caught, and the types of fish they ate. Researchers compared the species and noted whether they tended to be high or low in mercury contamination. For example, swordfish and shark are considered high in mercury, while salmon and sardines are on the lower end of the scale. Toenail samples were collected from both groups and the mercury levels were measured. Researchers also measured the levels of mercury found in toenail samples from participants with ALS and compared those levels to people without ALS. The researchers said the link was not hard to find. Among people in both groups, those who ate the most fish were twice as likely to be in the group that had been diagnosed with ALS. More than 60% of the group with ALS were in the top 25% of estimated mercury consumption, compared to 44% of those who didn't have the disease. Those who had the most mercury in their toenail samples were more likely to be in the ALS group. The researcher point out that their study is merely preliminary and needs to be replicated by additional studies. They also point out they are not suggesting consumers avoid fish, but rather choose species that are lower in mercury. 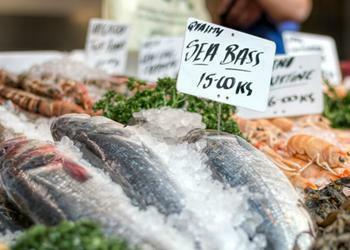 Last month, the government issued advice to consumers about what fish to eat and what to avoid. The agencies involved found pregnant women were not eating enough healthy fish, and advised them to consume more salmon and avoid swordfish.